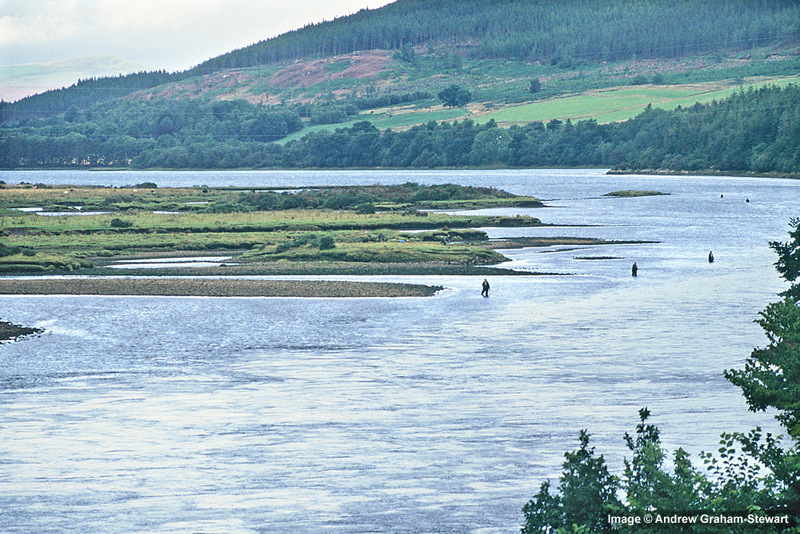 The Kyle of Sutherland is the tidal estuary for the rivers Carron, Oykel, Cassley and Shin, pouring into the Dornoch Firth at Bonar Bridge. Each of these rivers has a large catchment extending to near the West Coast and is a renowned salmon fishery in its own right. Collectively they rival Scotland’s ‘big 4’ salmon rivers. The River Carron is the most southerly of the Kyle of Sutherland rivers. It’s a fast flowing medium-sized river running for some 25 miles from its source near Beinn Dearg in Wester Ross, in an overall Easterly direction to the Kyle at Bonar Bridge. Catches on the Carron are typically in the range of 600-800 salmon/year. The Shin system was developed for hydro-electric power generation in the late 1950s. Although the Shin system is huge, extending for some 25 miles to the north-north-east, the Shin is now just a short river, flowing for just 6 miles from the dam at Loch Shin, to the Kyle. Shin Falls about half way along the river’s length is a famed viewing point for leaping salmon, particularly after rainfall in the summer. The Cassley is the smallest of the Kyle rivers, and a classic spate river. Its source is a chain of lochs on the north flank of Ben More Assynt. From there the river flows south-east for approximately 18 miles to join the Kyle of Sutherland just downstream from the Oykel at Rosehall. The Oykel is the most prolific of the Kyle rivers, typically producing 1000-1500 salmon/year. It rises on the southern slopes of Ben More Assynt flowing 6 miles to Loch Ailsh and from there for a further 14 miles to the Kyle at Inveroykel. The main river is split by the Oykel Falls into the Upper Oykel and Lower Oykel Fishings. An important tributary, the Einig, joins the main stem of the river just below Oykel Bridge that drains a huge area to the east and south-east of Strath Oykel. The fishing on all these rivers is let weekly as advanced lets, and it is nearly impossible to get day permits. However, there is some very good fishing on the estuary, through which all fish must pass, available from the Kyle of Sutherland Angling Association. The Kyle of Sutherland estuary extends for about 12 miles from the mouth of the River Cassley to a point about 500m below the bridge at Bonar Bridge. Permits for sea trout fishing, downstream of the bridge only, can be purchased separately. Salmon permits £33/day. Ardgay Store & Café, Tel: 01863 766801. The River Brora comprises two main sections of river separated by the large body of Loch Brora. 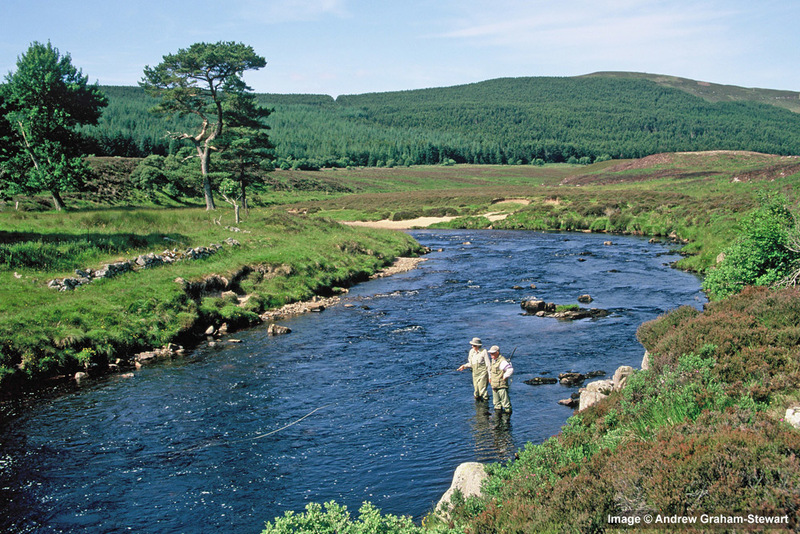 Above the loch there are several miles of excellent salmon fishing on both the Upper Brora and its even more important tributary the Blackwater. Below the loch are the Lower Brora fishings which extend for about 3 miles to the Estuary. The main river beats are very difficult to get onto, however there is salmon fishing available as day lets on the estuary and on Loch Brora. Just under a mile in length, comprising 5 named pools and 2 good runs. Permits £15/day from Linda's Café, Brora. Tel: 01408 621530. A large narrow loch 3 miles or so in length, situated in picturesque Strath Brora. Brora Angling Club has 3 boats available. The River Helmsdale has its source in the three interconnecting lochs of Loch Badanloch, Loch nan Clàr and Loch Rimsdale. From there it flows south east to Kinbrace before heading south down the Strath of Kildonan. The large catchment and control of the flow from the headwater lochs ensures extended periods of good river levels after rain. 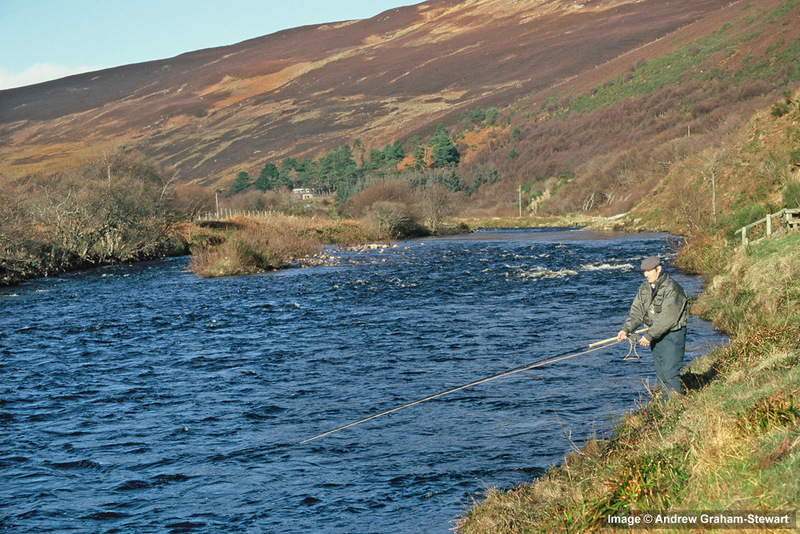 The Helmsdale is one of the most productive rivers in the Highlands with annual catches in the range of 1500-2000 salmon/year. This renowned Highland salmon river, particularly famous for its spring fishing, is essentially private with little prospect of availability. It is however possible to fish the Association water at the estuary. The association water is a mile and a half long, half of which is tidal, with lovely fly water and fast streams, including the Flat pool, one of the most productive spring pools on the entire river. Permits £25/day from Glencoast, Helmsdale (01431 821372).